Railcars are not a normal staple of the Pitboxes but this superbly built Mercedes had us intrigued, as another almost identical car is known to exist. Was it commercial or the work of a very gifted enthusiast? The multitude of louvres are so precise, especially in such a small scale. Similar cars can be spied in contemporary magazine reports, which suggests that it may have been a production model. More research required. 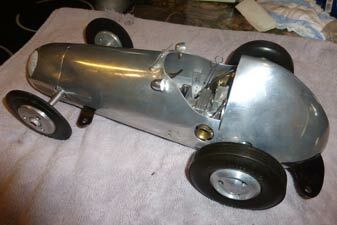 This Borden Mite was another of the cars run by Joe Shelton during his time in the UK. He claimed later in his life that it was his favourite car and the one he retained the longest. He started his involvement over here running his own 10cc car but then moved into the other classes with borrowed cars, so this may not have been his originally or it may be a replacement for the one he was running here. 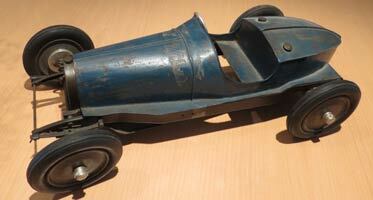 The car is an original with magnesium pan and body and unusually, a serial number, which is 3. 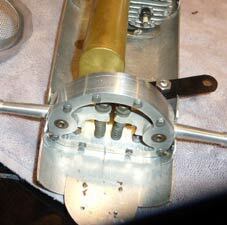 The motor is a Dooling 29 built by Joe Ilg. These two cars are both British and built by J T Wright of Leicester. 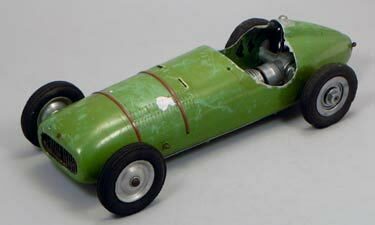 The streamliner is dated 1950 and is fitted with a MKI ED Racer, which would be spot on as that was the year they were introduced. 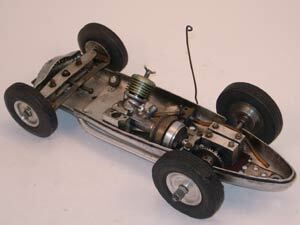 The cobby little racing car has the earlier ED MKIII motor mated to an ED clutch, which is again just about right for the date on the plate of 1949. The bevel gearbox appears to have come from E&M models. The tyres are clearly marked 'Selfcraft' 'Cressite' whilst the blue car has what look like ED 'Speedicord'. 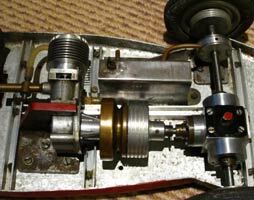 The clutch and gearbox in this car do look as if they were purpose built by Mr Wright. 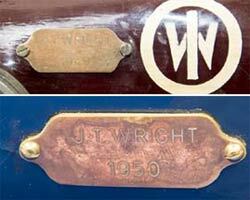 It is believed that one car was run by Mr Wright and the other by his son. 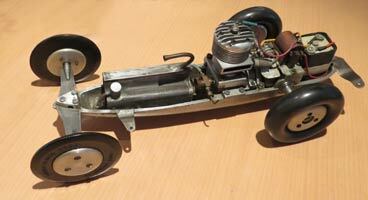 Whether they were members of the Leicester Mini Car Club requires more research. It is not often that a car is found complete with its pitbox, which makes it even more appropriate as a 'Pitbox' feature. conventional car at some stage as it has an air scoop similar to the MCM Austin and many other cars of the late 1940s. 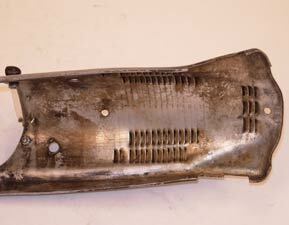 It is however the pan and body that is the work of art and indicative of someone that really knew what they were doing with panel beating equipment. 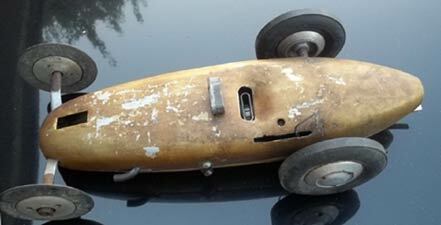 The 1066 tyres and wheels finish the job off and it would be wonderful to be able to identify the maker at some stage. 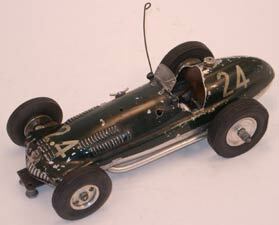 This Oliver 'Bottoms Up' was owned by Joe Shelton, an American serviceman who raced in England and Germany whilst posted here in the late 40s and early 50s. What is unusual about this car is the very rare Oliver Tiger MKI rotary valve motor in wide wheelbase configuration. 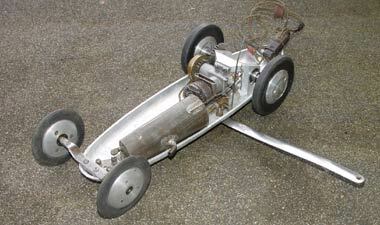 From the cutout in the pan, a MKII was fitted at some stage, but it gets even more odd as a curly carb has been fitted, which must be unique. 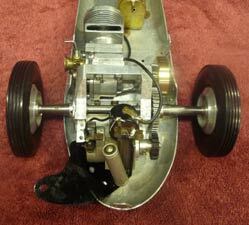 The disc front wheels are Keil Kraft aeroplane items. Joe Shelton raced in every class, so whether this car did duty as a 1.5 and a 2.5 is open to conjecture, but a wonderful piece of tethered car history. 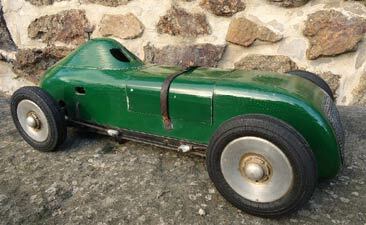 This is the twelfth of the Special bodied models to come to our attention. This has been in the owners family for a very long while during which they have run the motor. The threads on the axles are handed, but if the car is not on the ground, one wheel can unwind when the motor is running, whilst the other will unwind when it stops, as the owner discovered when it flew past him at a rate of knots. The tyres on this particular car are Cressite, which were fitted as standard alongside the more familiar Dunlop Fort. Nothing unusual about this classic combination of a 1066 Conqueror 10cc motor and 1066 Conquest car, except that the car has yet to turn a wheel in anger after 65 years. 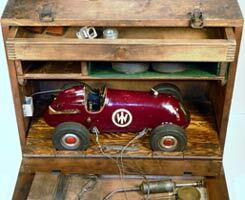 The current owner was present at Praill's Garage Hereford in 1949 when Geoffrey Hastings and Mr Wheatstone demonstrated tethered car racing to 900 members of local youth clubs, including the ill fated 'two at a time' system. This car shows all the signs of being a factory version judging by the intake slots and cockpit cut-out. 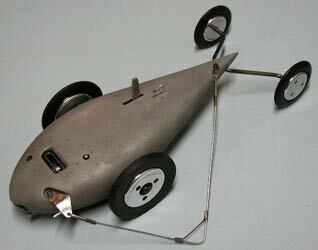 This delightful little car kit was marketed from the beginning of 1951 by Bert Walshaw from Dorset. It is relatively small, and the tether points made from picture rings are hardly substantial. 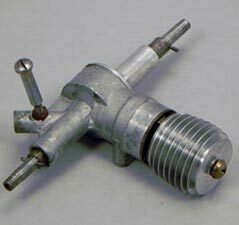 It is however the motor that is of more interest, being an ERE manufactured by Henri Baigent. 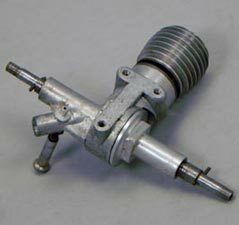 These alone are rare, but this example is even more so, being a purpose made twinshaft with the mounting lugs cast in, rather than a converted aero engine with conventional lugs. 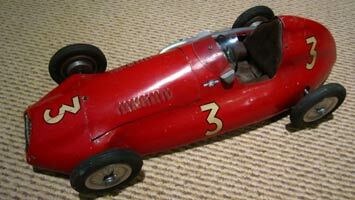 A complete car was £12, but kits were available slightly cheaper, and a Ferrari version was also available. There may be other examples of this motor out there, but for the moment, this car that was lurking under the bench at Gildings sale is the only one known to exist. 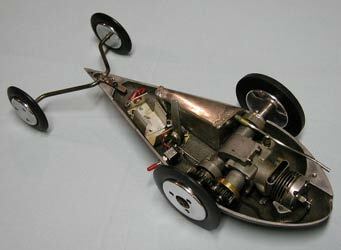 The 5cc spur drive drive car designed by Ian Moore and raced primarily by his wife Ivy was probably the most successful 5cc British car ever. 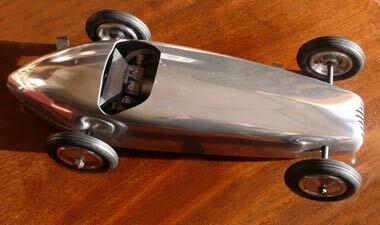 The original version that was scrapped had an ETA 29, whilst the record breaking car had a Dooling fitted. These two versions, identical to the original in almost every respect, were almost certainly built by someone in the Guisely or Ossett clubs up in Yorkshire. Coincidently one has a Dooling motor and the other an ETA. 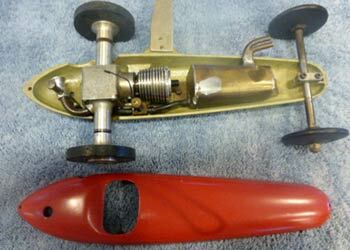 The one on the right still had the original glow lead and plug and fuel syphon. The plans were published in 1951, so the cars may well date from around then.